Blended Soy Coffee Beverage. At Home, My Way. 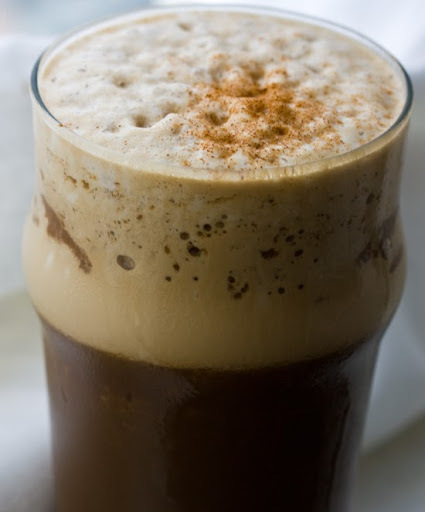 Ever since Starbucks unveiled their vegan-soy-Frapp-friendly However-You-Want-It Frappaccino menu, I have consumed a steady stream of Soy Coffee Frapps whenever a craving for frosted coffee bliss hit. And with a steady stream of 80 degree days lately - Frapp cravings hit a lot! Frapp At-Home. But as I was slurping down my huge, sticky-sweet Venti Soy Coffee Frapp the other day, I decided I needed an alternative option to satisfy my Frapp cravings. 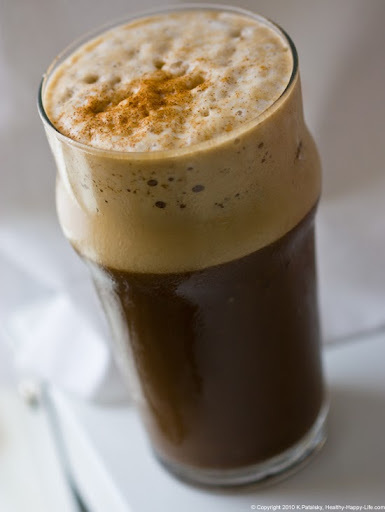 So, I whipped up this frosty, creamy, coffee-flavored beverage - at home. Starbucks Via. Don't worry Starbucks, you might not mind my Starbucks-fake-out recipe because one of the main ingredients I used was Starbucks Via instant coffee packs. I had bought a Via sampler pack a few months back (mindless register purchase. Since I usually drink chai, not coffee at home). So I had quite a few Via packs stacked in my pantry. But yippee, Via is a perfect add-in for a cold blended coffee beverage! However, you can also use brewed/chilled espresso or coffee if you'd like. I've posted two variations below. 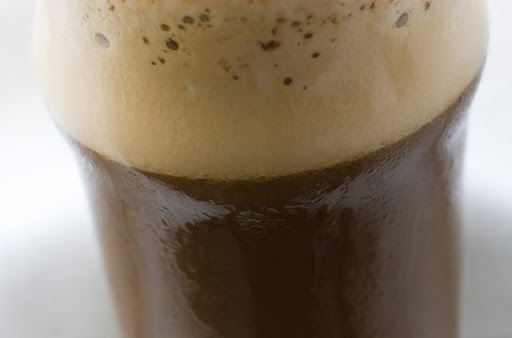 QuickTip #1 Pre-Made Espresso: Those little canned Illy sweetened Espresso drinks (the dairy-free kind) are a great go-to item for this recipe. Not necessary - but good for a super fast craving buster blend. Quick Tip #2 Guar Gum: A blog reader gave me this tip: Guar Gum would help prevent the natural separation effect in my coffee drink. I have never tried Guar Gum - but it may be fun to experiment. Bob's Red Mill carries a package of it for sale on Amazon.com. However, do your research on guar gum before using. I personally think I'll just stick to drinking my at-home-frapps quickly before they separate. Bob's Red Mill Guar Gum description: "Gum, Guar is a white flour-like substance made from an East Indian seed. Use small amounts as a thickener, binder, and volume enhancer." Guar GUm info on WebMD here. Flavor Variations. 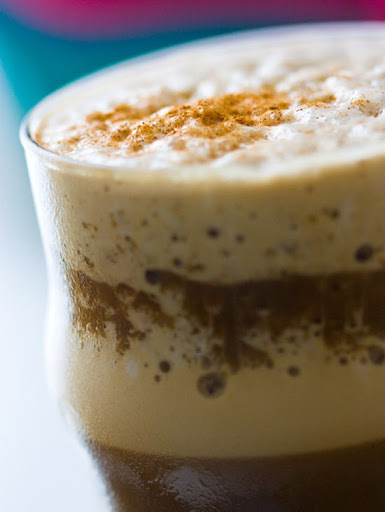 Before I get to my recipe, I want to inspire you to get creative with your at-home-coffee bevie. 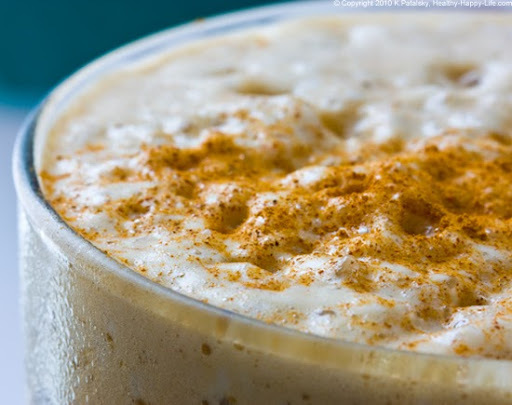 Here are a few flavor/ingredient-add-in options..
Cinnamon-Sugar: This is the flavor combo I used below, I blended cinnamon into my drink and sprinkled cinnamon-sugar on top. Mocha: Add 1 Tbsp sweetened cocoa powder OR a Tbsp of chocolate nut spread. 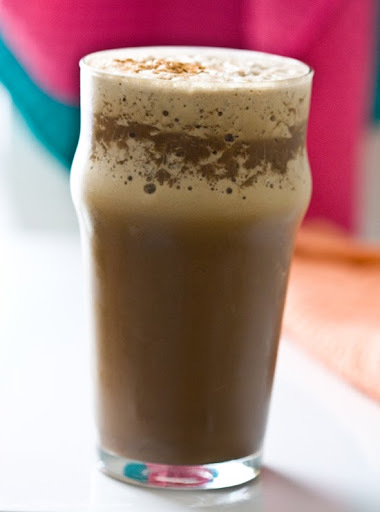 Banana Thick: I love adding a frozen banana to my coffee blended drink. It thickens the texture up a bit and adds a mild tropical sweetness. Coconut: Add a few Tbsp of shredded coconut to your drink before blending. Minty: Add some fresh mint to your blender for a fresh cool flavor accent. 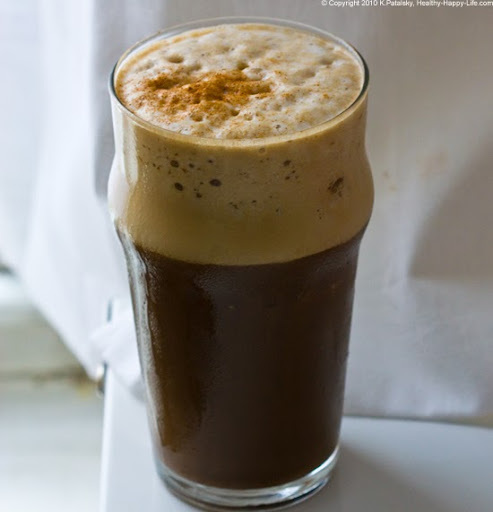 Peanut Butter: a few scoops of peanut butter will turn your icy bevie into a decadent shake. Cayenne: Add some cayenne in your drink for a spicy kick. Soy Whip: Add some on top if you'd like. Choco-Chips: Toss in a few raw cacao nibs - or some dark chocolate chips for that "chip-shake" taste and texture. Creamy: Sub a few Tbsp of the soy milk with soy milk creamer. Protein Boost: A few scoops of your fave vanilla, chocolate or coffee flavored protein powder. Hemp or soy protein are my favorites. 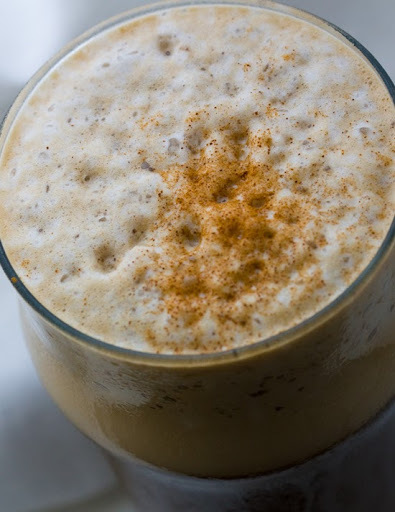 Chai Version: If you aren't a coffee drinker, make a Chai Blended bevie! I like to use Chai Concentrate in place of the coffee and I don't need to add sweetener since Chai concentrate is pre-sweetened. Info on my favorite chai concentrate brand. Note: Natural settling of frothy foam/liwuid will occur - but simply do a brisk stir with a straw to re-combine the froth with the liquid. "How do you like your coffee?" Note: Like coffee, everyone likes it prepared a bit differently. So be sure to add more sweetener or stronger coffee flavors if that's what you crave. This recipe is easy to adjust based on your preferences.